My dad is in the habit of shopping in fresh fruit and vegetable markets, and he loves bargains. When things are cheap, he buys LOTS, like boxes of the stuff – for everyone in his whole family. I came home to find a huge box of strawberries on the doorstep. As I was washing them, I realised they had already passed their best moment, and that they had to be eaten TODAY! And so it was Muffin-Making Time! 1. 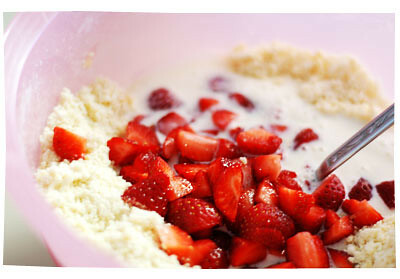 Sift flour into a large bowl. 2. Mix in lemon rind, sugar then egg, butter and milk. 3. 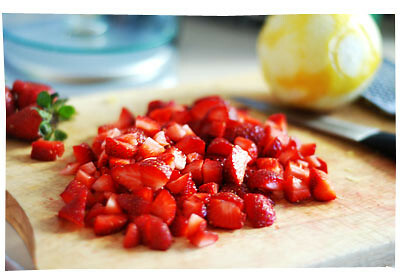 Then stir in berries. 4. Spoon mixture into greased muffin pans. 5. Bake in 180C oven for 25 minutes until golden. 6. Drizzle with lemon icing glaze on muffins while hot. Notes: Perhaps I went overboard with the strawberries, and maybe just 1 cup was enough. 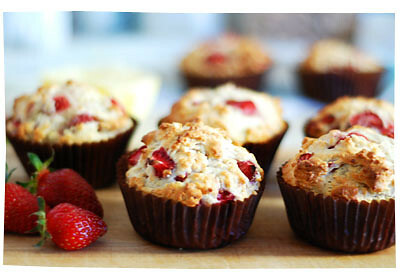 But I love my muffins packed with fresh fruit!